Common issues found in our summertime lawns! It’s no surprise that it’s hot.. in Texas.. in July. With all of this heat comes stress on your turf and landscape so some of you may be noticing some browning in the grass and plants. Is it lack of water or could it be something else? Let’s dig in and see! As a homeowner, watering adequately while being on our program is single handedly your most important role in our business partnership. If the plants or grass is not getting enough water, this not only compromises the uptake of our application but can put the turf in a weakened state, which can make it more vulnerable to diseases and pathogens. If you’re noticing some stress on your turf at this time of the year it is a good idea to take a look at the amount of time you’re watering and at what rate. A good rule of thumb is to physically check the soil to see if it’s wet or not. Cracks in the soil are also an indication of dehydration. 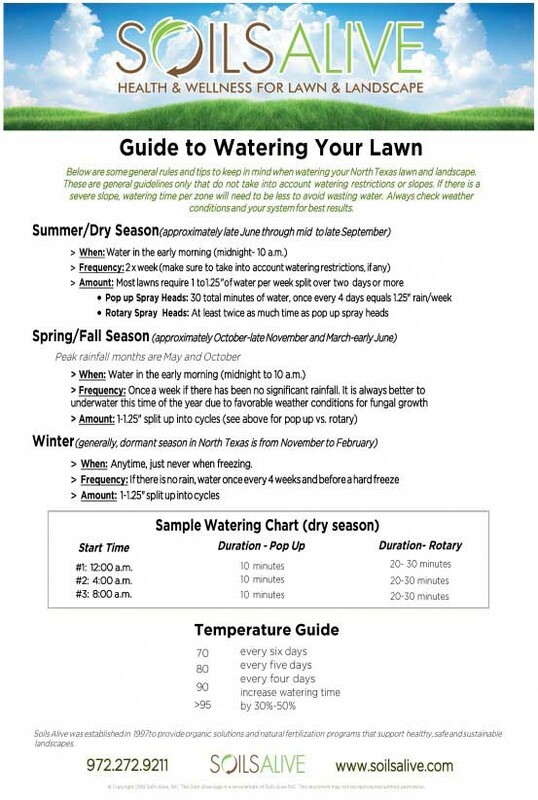 Our watering guide is a great resource for lawn novices. With the temps this summer it is best to increase your watering amount by 30%-50% at each watering interval. Be aware of local watering restrictions. Most DFW cities have designated days to water so be sure that you’re in line with city code. If you’re curious about DFW watering restrictions, go here to see if your area is operating under any restrictions. While you may have ruled out the amount of water as an issue, there still could be the even water coverage factor. Sometimes when you turn your sprinklers on it appears that water is getting everywhere but, there could be a tiny particle of sand or dirt restricting adequate water flow to a specific area. This 1/16 of an inch could make or break the turf in these scorching weather conditions. Irrigation audits from a licensed irrigation expert are highly recommended if you have an inkling that even coverage is not being distributed. 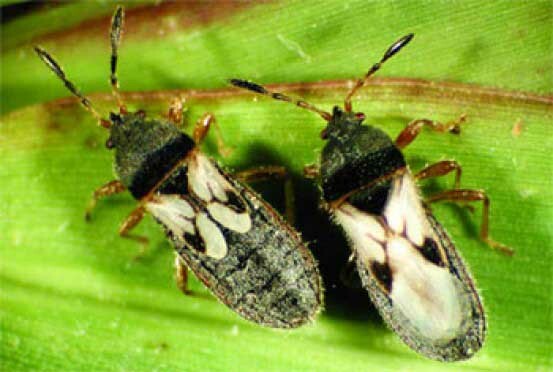 Chinch bugs and grubs are the most common pathogens at this time of the year. While Chinch bugs like mostly St. Augustine, grubs don’t discriminate. Chinch bugs are classified as piercing sucking insects and they LOVE the heat. Most common places to see chinch bug damage is near concreted areas. The way that they cause damage is by injecting a toxin into the plant to remove the nutrients. This fluid is toxic to the grass which in turn causes the grass to yellow, turn reddish brown, and eventually die. This damage can occur extremely rapidly if left untreated. Consulting a plant health professional is highly recommended if there is speculation of chinch bugs. Chinch bugs can be seen by pulling the turf back to expose the soil. They usually scurry quickly once they are exposed so check in several different places on the outer edges of the damaged area. Grubs have a very particular time of the year that they cause damage that is based on their life cycle. In North Texas it is Late July- August. Our culture has been trained to think that all grubs are bad but in truth, they aren’t. Grubs are very common to see when you’re digging around in the flower beds or in the yard because they play an important role in the soil food web. There are 12 species of grubs in North Texas and only 2 of those are root feeders. So, there are 2 species that could potentially cause damage to your turf and only do so in very large infestations. This year, their life cycle has been delayed and we have just now seen the June Bugs emerge. Some of you may have thought the June Bugs had already come up but there happen to be other beetles that impersonate the common June Bug. Once they emerge, they have a mating period of about two weeks and then the females descend back to the soil to deposit the eggs. After about 3 weeks the grub larvae hatch and begin to feed. So, grub damage should not be occurring until mid-late August this year. A tell-tale sign of grub damage is the lack of effort it takes to pull up the dead turf. If it pulls up easily or rolls up like carpet, grubs could be the culprit. Also, seeing at least 6-10 grubs per sq ft of area is also a good indication they are causing the damage. Whether it’s a lack of water coverage or a possible disease, seeking help by a professional is going to be your best option. While turf can come back from moderate dehydration, chinch bug or grub damage is classified as “what’s done is done.” The turf that has been damaged will not come back and depending on how large the area is that was infected, it may need resodding.